Olympic support PG 2011 - Site de spbbf ! 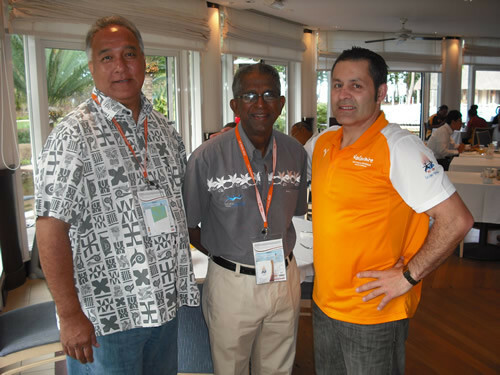 Vidya Lakhan, President of the Pacific Games Council; Chairman & President of the Fiji National Olympic Committee (FASANOC) and Patron of the Fiji Bodybuilding Federation, who was pleased to see one of Team Fiji won a medal in the Heavyweight competition.Ricardo Blas, Secretary General of the Oceania National Olympic Committees; President of the Guam National Olympic Committee and Immediate Past President of the Pacific Games Council, who supported Guam’s participation in the bodybuilding programme at the 2011 Pacific Games. Team Guam won three medals and really set the standard of competition at the Games.Says Philip Hope, “we are very fortunate to have the support of these two esteemed officials who provide effective governance of sport right across the Pacific. I am especially grateful their active interest also extends to bodybuilding and it was great to see athletes from their countries also do well at the Games.In all I am proud every member country of the Pacific at the Games with athletes in the sport of bodybuilding, also made the finals. This result is a very good reflection on the work of our administrators and also the Olympic officials who help us to continue to develop our sport”.